If you are looking for budget Goa Package then you are on the right place. Only Holidaytravel.co is offering this budget Package with good accommodation and facilities. In this package we are providing well furnished ac room, breakfast, one day south goa siteseeing and many more. Goa is very colourful and welcoming place to visit for spending holidays and this distinctive west coast state is known as the ‘Pearl of the Orient It revels in its party-paradise reputation during its countless festivals whether it’s a low cost option or all out luxury, Goa has it all. Take a sunset stroll by the palm trees, Let your worries float away with cheap holidays to Goa with holiday Travel. We are providing this package less than 20% from its market cost. We are giving lots of business to these resorts due to high traffic on our website from last 5 years. It’s all about the way we buy and package everything together for you. With so many tour operators, airlines, brokers and suppliers, we hunt out the best deals and package everything together to offer you low cost holidays. Note: Above package rates will not applicable during New Year, Christmas, Diwali, Valentinday or any National Holiday. • Airport / Railway Station transfers by non ac Car/Coach. • No extra charge for children below the age of 5 on package plans. • One day sightseeing trip by non ac Coach to South Goa. • Free use of indoor games / swimming pool (with proper swim wear). • Extension of stay available on pro- rata basis. Day 01: Arrived at Goa Railway st.
Baga Beach. Baga beach is for sure the most happening beach in Goa it is Located in the northern side of Goa, Baga Beach stands amidst green hills and majestic Arabian Sea forming an eye-catching landscape. 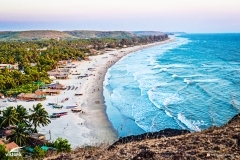 The coastline of the beach lies between that of Calangute Beach and Anjuna Beach. It offers a beautiful view of the amalgamation of a small river into the Arabian Sea. Catching fishes and spotting dolphins make up for an interesting pastime at the beach. The liveliness of the beach is much popular among the domestic as well as the foreign tourists. It is known for its water-sporting activities. Water sports like Gliding, Para-sailing, Water surfing, etc. are the prominent attractions of this place. Apart from these adventures, Baga Beach is famous for its beach shacks and the delicious sea-food that is offered there. The night life at Baga is even more exciting than its days. Baga Beach is the home to some of the hottest night clubs like Tito’s and Mambos which are always crowded with the dance freaks. Calangute Beach: Calangute Beach Also called the ‘Queen of beaches’, Calangute is the largest beach in north Goa. Calangute along with Candolim, Baga and Anjuna form part of the beach stretch extending from just outside Panaji city to Fort Aguada Calangute is Goa’s busiest and most commercialized beach town Its sand shelves steeply and could be risky for children. However, the beach is large enough to accommodate the thousands of tourists that visit during the high season. Calangute is more of a family destination. Nightlife in Calangute is tame, as night clubs and bars shut down at 10 pm. The beach is popular among tourists due to the availability of restaurants, clubs and shopping activities. Calangute is also famous for its water sport activities. One can experience para-sailing, water surfing, banana ride, jet-ski.